Click the "Start to Monitor" button well in advance of the actual motion (the button will now read "Click at End of Video"). When your student completes the motion, simply click the button again. The video will then automatically be saved to file. Use the up/down buttons to select the total amount of seconds that you want to capture. 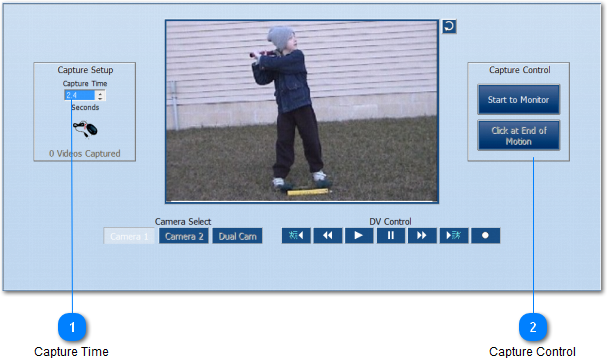 Pressing “Start to Monitor” will cause SportsCAD to continually capture video. Pressing “Click at End of Motion” will stop the capture and save the save the amount of seconds selected for the capture time.